Late 2011 and most of 2012 it was just watching the deterioration of my mum happening right before our eyes and I knew there was nothing I could do! In the later part of 2012 mum couldn’t eat anymore, She had been reduced to a soft diet earlier on in the year and had monthly checkups with the nutritionist is Tallaght Hospital. We gave her anything and everything she wanted even if it was only a bite or a sip, in our eyes if she wanted it she got it! Dad used to make her smoothies daily and sit there patiently as we tried to get her to swallow and finish it. It got to the point in January that she could not go on like this. The last few months of 2012 was when this idea of a “peg feed” came in. At first we dismissed the idea –‘it was our mum, she doesn’t need something like that.’ Until, the harsh realisation hit that if she didn’t have the peg she would not be able to fight this battle much longer. In February she was admitted to the McGuire ward in Tallaght again and had the peg tube inserted into her lower abdomen. They sedated mum for the surgery as thankfully it’s what they call a “minor procedure”. By this time I had quit work, so I spent every day in the hospital with mum through her recovery. They were very keen to send her home the same way that she came in – with reduced mobility but still very much able to walk aided! Unfortunately, even with all their efforts mum just took another step down in the illness. Dad and I got great training and wonderful support in learning how to use the tube, rates of feed etc. We got to take her home late March and the next part of our journey began. Mum and dad still slept in the same bed so she would be getting her feed through the night and dad would be there to monitor it, she would also get her medication through it daily. This was our lives for the next few months, mum had no voice to communicate to strangers but the people that were closest to her knew exactly what she was saying. We knew every whimper, every breath and every sigh and what they meant. Even with the peg, she still went to the Carmen Centre on Wednesday and the ever-so important Saturday Breakfast Club. Dad used to go out to Bray seafront and would push her in the wheelchair up and down the promenade. Then they would go in and dad would play the slots while mum watched and sometimes played with him. She seemed to be doing well with the feed, putting on a few pounds here and there. But it all just got a little too much for her tired body. We knew something was up with her as she would moan out and none of us knew what this noise was trying to explain to us. She could communicate only by pointing to the peg, we brought her up to the GP and he suggested we just pop up to Tallaght Hospital for an X-ray to rule out anything on her chest. Dad called to explain what was going on. I rushed straight up to the hospital. They had her already in a cubical and did the X-ray and the bloods- all of which we assumed was normal. Then the doctor came over to talk to Dad and me. She explained that her lungs seemed fine but there was something more serious. She was bleeding internally and they were not sure why or how. You can imagine the shock we got as we couldn’t even fathom more bad news. They admitted my mum straight back to the lovely Mc Guire ward with the amazing staff. We knew we were in safe hands. She received four blood transfusions. She just seemed to be rapidly deteriorating over the course of the next few days. Surgery was ruled out as she was too poorly to go under any form of anaesthetic so that wasn’t even an option. They got their palliative team involved at first just for pain maintenance. Over the course of the few weeks there we were approached to have a family meeting with the palliative care team. Our worst fears came to light when we were told that mum would not be coming home with us, and that we had to explore the idea of hospice care. Collectively my dad Gareth and I made the decision that her comfort was the biggest priority. I remember sitting in the hospital room with my dad and mum, Sunshine Radio playing – it was mums favourite and was constantly on. There was never silence in the room. The palliative nurse came in.” We got you a bed in Blackrock Hospice and you leave tomorrow.” I had been sleeping on a chair beside mum for the past few nights and there was nothing different about this one. We organised that I would travel with mum via ambulance to Blackrock and we would meet dad there with all her belongings. When I woke that morning I went for a coffee and as I walked back to the room a blanket of fear flooded me, this was it. My mum was going to die. How in God’s name did we get here!! . I walked back onto the ward and saw the ambulance staff heading towards her room. They put her on the stretcher and off we went down to the ambulance, nearly having a guard of honour as we left the ward. As most people will find with this illness, for the family, sometimes things all just become a blur and before we knew it we were settled in our bed in Blackrock Hospice. I will never have the words to describe how truly amazing the staff were there, but they didn’t ever have anybody there with PSP. They were unsure how the next few days were going to unfold .Because of her condition it was hard to determine how long she could fight and hold on for. Two days shy of Ida Gibbons’ 64th birthday she lost her battle with PSP…. I hope that by having my mum there that they are a bit more aware of how patients are when they are on their “journey”. While throughout my mum’s illness everyone we came across was doing the best they could with the knowledge they have – their knowledge just isn’t enough. People need to speak out more and families/loved ones/and more importantly the person who has this horrible illness needs to be cared for and minded in a special way right up to their last breath. 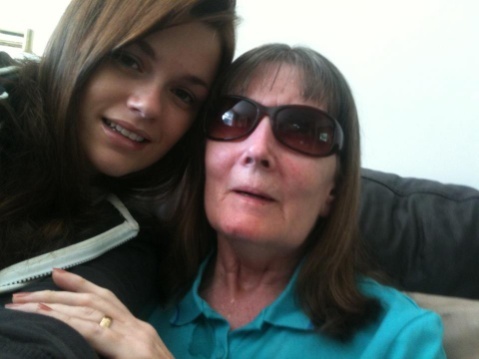 My mum was a wonderful person who will live on in me for the rest of my life. I WILL NOT let all her suffering and torture be in vain. It is my families’ goals to help people just like us understand what PSP is and how it rips everything you are down to nothing. At 11.07 on the 25th of October 2013 my mum passed away and our lives changed forever.